Growing some of your own organic vegetables is a great way to increase the amount of fresh, organic food in your family’s diet while saving yourself some cash. But it is also easy to waste money, especially if you get seduced by marketing hype and buy lots of stuff you don’t really need (e.g. hybrid seeds or fancy containers for planting), or if you don’t select your vegetables strategically.Here are 8 tips to help maximize the return on your investment. Grow the veggies you and your family already buy and eat, and plant as much as you eat. These can include veggies that are best fresh or those that are expensive or hard to find fresh in your local groceries.Next, it is important to plan and include some veggies in your garden that will produce for months like cherry tomatoes, cucumbers, and string beans. And for vegetables you plant and harvest just once, like radishes, choose varieties that mature more quickly Optimized space is money saved. Start almost all veggies from seed. You can find seedlings of almost any veggie in almost any Garden Centers. Plants grown from seeds will almost always catch up and outperform them.Buy old-fashioned, non-hybrid seeds because these are less expensive than new hybrid seeds. However, disease-resistant hybrids may be a good investment. There are, however, a few exceptions to the “start everything from seeds” rule. Heat-loving plants like tomatoes, peppers, and eggplants take a decent amount of planning and timing to start from seeds indoors. This can be quite expensive, especially if you don’t have any sunny windowsills to start them on and don’t own grow lights—than buying packets of seed when you only want one or two plants. Be in contact with anyone you know who’s interested in growing their own delicious fresh vegetables, and coordinate a seed swap. Most packets contain more seed than the average herb gardener will need in several years, so splitting up multiple packets can end up being a big money saver. Whether new, or an experienced gardener, it is important to start small—no more than 10-by-10 feet, or two 4-by-8-feet raised beds. You will harvest more out of a small, well cared for plot (and have a lot more fun) than you will from one you lose to the weeds mid-summer. Many vegetables grow well in containers. Look for compact and quick-maturing varieties for best results. For tall or climbing veggies, you can install a sturdy trellis as you are filling the container with soil.If you want to save money, don’t think of buying new containers—as long as you can cut or drill holes in the bottom, you can turn just about anything into a great pot. Big is better, since that will reduce how often you need to water. Large veggie plants are thirsty! Buy an organic potting mix designed for containers. For a few veggies, a little primping and pruning can ensure that they keep delivering throughout the growing season. For instance, lettuce, spinach, and many other greens can be harvested multiple timesNote: Baby greens (e.g. baby spinach, which are simply less mature spinach leaves) grow super fast, and you can get multiple harvests by snipping them off with scissors, leaving the base of the plant. Use everything you raise! Got some extra? Place them in the freezer, make refrigerator pickles, share them with friends, or donate them to a food bank. You should always save any extra seeds to spread out the cost of a packet. 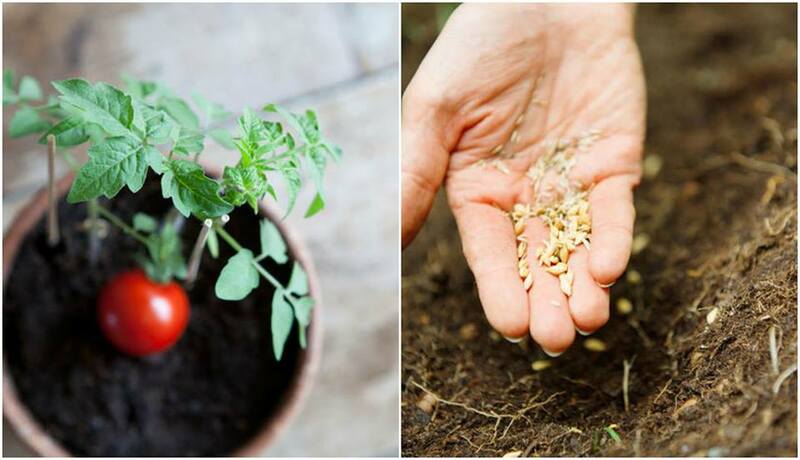 Store unused seeds in a dark, dry, room-temperature location. Take advantage of end-of-season sales, too.